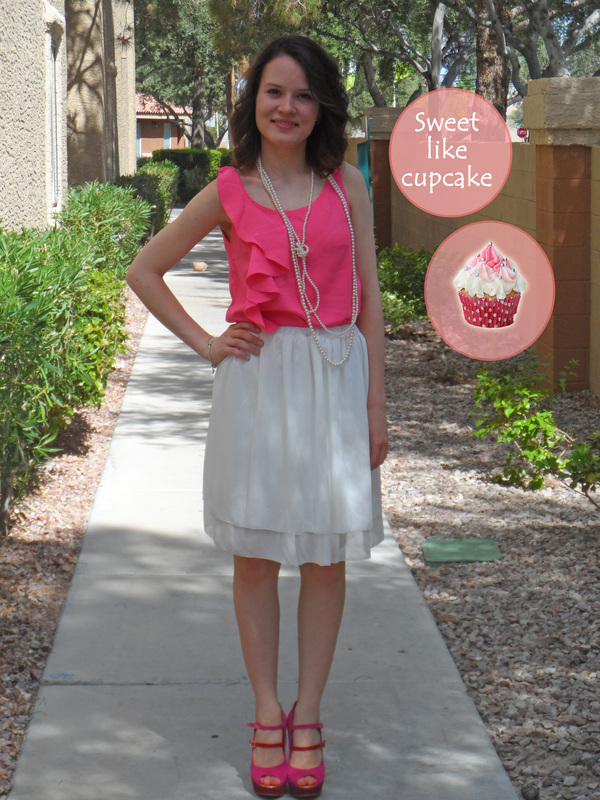 Let’s sugarcoat it: ruffle top and layered skirt DIY! – Go ask Alisa – DIY capsule wardrobe one stitch at a time! Let’s sugarcoat it: ruffle top and layered skirt DIY! Let’s talk SUGAR, SPICE and everything NICE! Oddly enough, since being a little girl I never really enjoyed pink color. It was never my thing, and if to be honest I grew up with quite dislike towards everything pink. I can not really explain, it just happened so. But growing up and actually starting to know the difference between pink, soft blush, baby pink, hot pink, fuchsia and other colors in pallet of pinks made me realize that on some occasions pink is just what I need. When summer is in town it is one of my favorite colors to wear. Paired up with white, or maybe neon, it creates fresh and sweet look for those breezy summer days. besides, if you make it in layers and ruffles, like I did, then it is a perfect party outfit right there! Check out monthly sew-alongs at The Monthly Stitch ! Patterns: here comes the fun part – I have used these pattern million times! They are SO basic, that you can modify them up to your taste and preference, any way you like. Top: Burda 8/2011, 105 (see pattern). It is a dress pattern, but all you need to do is to shorten it. And… it is so basic, there is nothing too special about this pattern, You can copy one of your existing tops that you have in your closet, or maybe draft it yourself. Check out my other outfits and sewing showcase over here! It reminds me a lot of the chiffon american apparel skirts! I recently found one at the thrift store (in the childrens section, at the low price of 4$!) and it has become my favorite skirt for summer! I might have to make one ! 4$ is a great price, and that’s approx. how much did it cost me to do my skirt. Maybe a little less, and that’s what like about sewing – you can cater to your own finances and abilities. Sometimes I get fabric worth 45$/yard, sometimes I thrift it. I am glad that you enjoy sewing and I am looking forward to see your projects! 🙂 Cheers! I have a very hard time sewing with elastics, so once I get the confidence to try it, I may have a few questions for you! That is an awesome outfit!!! You look great! Love your outfit! Thank you for sharing at Bacon Time. What a gorgeous outfit. I didn’t love pink until I got older either, now I love wearing it. You are so talented! Makes me wish I could sew. This looks so light and cool…love the pink on you! Super cute and I love PINK too! I love to sew and used to make all of my clothes when growing up and then my children’s when they were young. A fun hobby to have. You did a beautiful job. 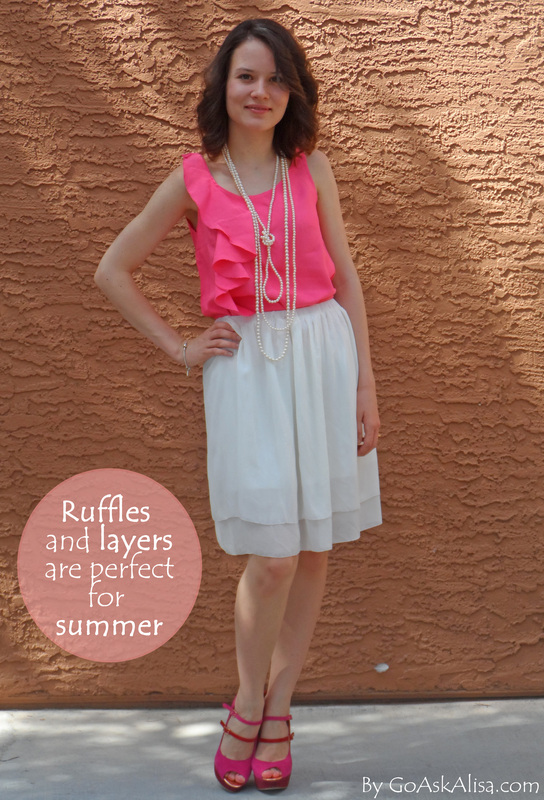 I absolutely LOVE ruffles and PINK! Beautiful! Next Next post: Wordless Wednesday: silence of nature or nature of silence?